As you can see, the ad has a plus box, clicking it, opens a lead capture form. (1) Google is charging the maximum cost-per-click on each lead captured. So they are charging a CPC based price for a CPA-like lead. 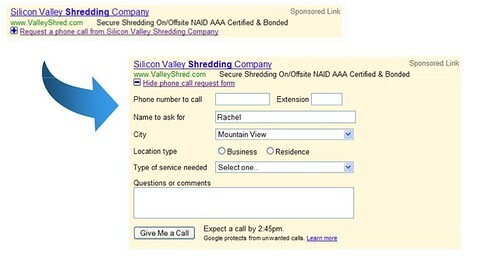 (2) Google is handling the leads much like any lead management company. They make you go through them to contact the lead. In short, Google gives you a lead ID number, you call the Google 800 number and enter the lead ID number into the Google prompt. Then Google connects you to that lead. PPC Hero has a lot more detail on how this all works. So check it out at PPCHero.com.